About the Jog Spa™ & Tulipani Enterprises, Inc. The Design for the Jog Spa was originally Designed and Developed in 1979 by Victor Tulipani to compete against the wooden Hot tubs of the time that were 6ft round and 4ft deep. The original Hot Tubs of the time required allot of water and did not necessarily offer very much in the way of a therapeutic benefit. Mr. Tulipani's spa design provided an open area for mobility as well as a circular seating area, a design which ultimately led to the development of the Jog Spa of today. Since the initial introduction of the Hot Tub, the Spa industry has evolved to meet the demand of consumers wanting more than just lounging, relaxing and entertaining. The need for Exercise, Mobility and Therapy has been one of the biggest demand in the Spa industry to date. The Spa industry's answer was the creation of the Swim Spa which provided an open area to exercise with increased mobility since most Hot Tubs leave you confined to the center. 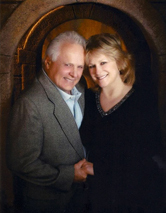 Mr. Tulipani has spent decades in the Spa Industry, always innovating, perfecting and helping to move the industry forward. It was through Mr. Tulipani's innovation with Swim Spa designs that led him to perfect and create the Ultimate Therapy Spa..The Jog Spa! Today the Jog Spa literally provides the best of both worlds the relaxation of a hot tub and the exercising and mobility of a Swim Spa. The Jog Spa's Patented design provides an open area for exercising, jogging and mobility with circular seating to enjoy the therapeutic properties that the Spa has to offer. JogSpa™ is an exclusive creation of Tulipani Enterprise,Inc. a Family run Wholesale Corporation who offers a diverse line of specialty products for your Health and Personal Care. Established in 1976, we have over 40 years experience working with extensive International and National customer base. Our Goal is to Distribute exclusive high quality products that are unmatched in the Industry and market them at a wholesale price. We are a small but a Dymanic Corp. that doesn’t offer extravagant literature or promotional hype. What we offer is Quality, Service and the best value for your Dollar!!! 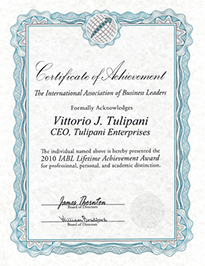 Vittorio Giovanni Tulipani is The Founder/Owner of Tulipani Enterprise,Inc. a Nevada County Company. My background is a Computer analyst executive for PG&E in San Francisco for 10 years. President of Peregrine Inds. for 12 years,1976-1984. Development of Handcrafted Teakwood Spas, Bathtubs and Sinks. Extensive Research/Development with OEM Int. for over 20 years in Export/Import Sales with access to 300 Manufacturers in China/Taiwan. Today’s American Authority on Portable Swim-Spas. 3 Decades of State of the Art, Deep Soaking Whirlpool Baths, Spas, and Swim Spas. Extensive Business relationships with major firms such as KOHLER / ELJER. Marketing my Teakwood products through ELJER, SEARS and US BRASS. Global sales in the Middle East. JAPAN,TAIWAN and SAUDI ARABIA. INTERNATIONAL HEALTH,RACQUET & SPORTSCLUB ASSOC. Catalist,Fitness,Sears Catalog,Eljer Catalog and US Brass.